The only (and I do mean only) redeeming thing about rain and chill and scarves in spring is that it allows me to continue making soup. I thought last night was a good night to get out Mollie Katzen’s classic “Moosewood” cookbook from 1977. Moosewood refers to the vegetarian Moosewood Collective in Ithaca, New York. Katzen was a member and the cookbook, featuring a collection of the collective’s recipes at the time, was both hand-lettered and illustrated by Katzen herself. “Moosewood” was listed by the New York Times as one of the top ten bestselling cookbooks of all time, and is arguably the most famous vegetarian cookbook in the world. It opens with the William Blake quote, “All wholesome food is caught without a net or a trap.” Words after my own animal-loving heart. I chose the Mushroom-Barley soup for its simplicity and lack of dairy. I try to keep my soups healthier without a lot of butter, milk, or cream. 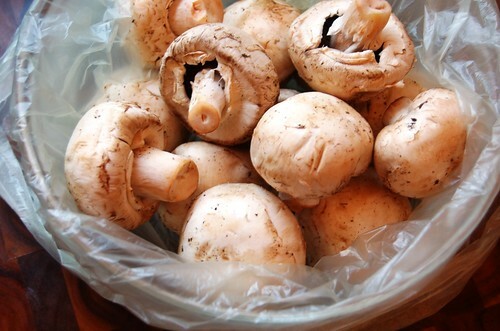 Gather one pound of fresh mushrooms…(oh, how I love mushrooms). 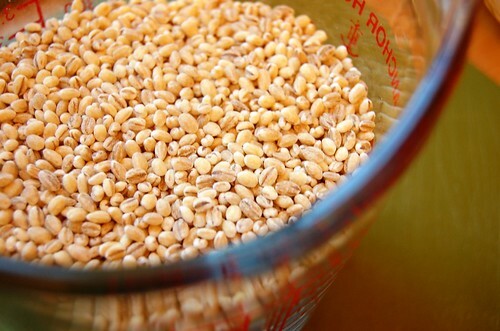 Pour out 1/2 cup of pebbly pearl barley grains to be simmered in vegetable stock with a little tamari and sherry. I had never heard of tamari, but found it with the soy sauce. Like soy sauce, tamari is made from fermented soy beans, but is thicker, darker, and not as salty as traditional soy sauce. Sautee a heaping cup of onions and 2 cloves of garlic. Add the enormous pile of soft, sliced mushrooms until everything is tender and fragrant and you can’t take how good it smells for one more minute. Add the mushrooms to the barley and stock and simmer it all together for a good 20 minutes, get out your parmesan for garnish, and you’re ready to warm up. 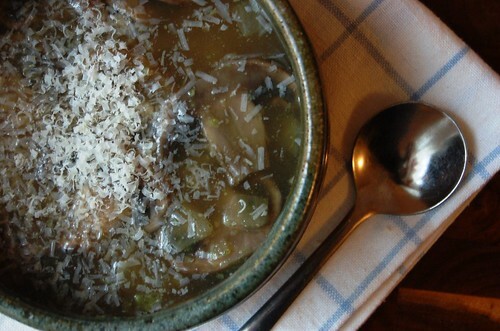 It’s not a beautiful soup – but the salty tang of the tamari and earthy, velvety chew of the mushrooms was exactly what I was craving, and I will be making this one again. Hopefully in the fall when the appropriately cold, wet days signal winter is on its way. Adapted from Moosewood Cookbook by Mollie Katzen. The edition in print today is a “new” version, printed in 1992 and featuring slightly healthier versions of the originals. Mine (and this recipe) is from the original 1977 edition. In a large soup pot, cook the barley in 1 1/2 cups of the stock or water until tender. Add the remaining stock, tamari, and sherry. 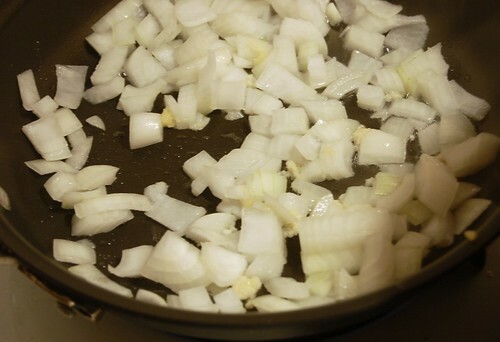 In a large saucepan, sautee the garlic and onions in the olive oil until the onions are soft and just translucent. Add the mushrooms and continue to sautee until the mushrooms are tender. 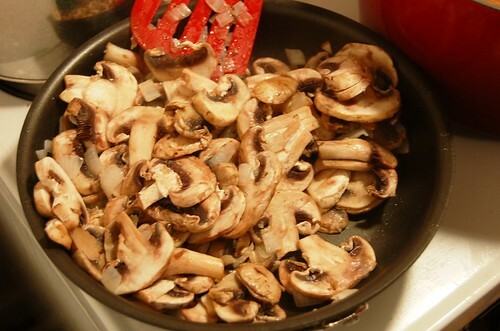 Add all of the mushroom and onion mixture to the stock, and grind a few turns of pepper. Ladle into bowls and top with fresh grated parmesan. Serve with crusty bread. Enjoy a bowl in sweatpants and try not to think about the fact that you haven’t seen the sun in days, and won’t anytime soon. You can still visit Moosewood today. The collective continues to serve its (mostly) vegetarian fare and publish a popular series of vegetarian cookbooks. I’m now picturing mushrooms scampering around and you chasing after them with a fishing net. 🙂 The soup sounds lovely. And man, that forecast is killing me! I have had enough! 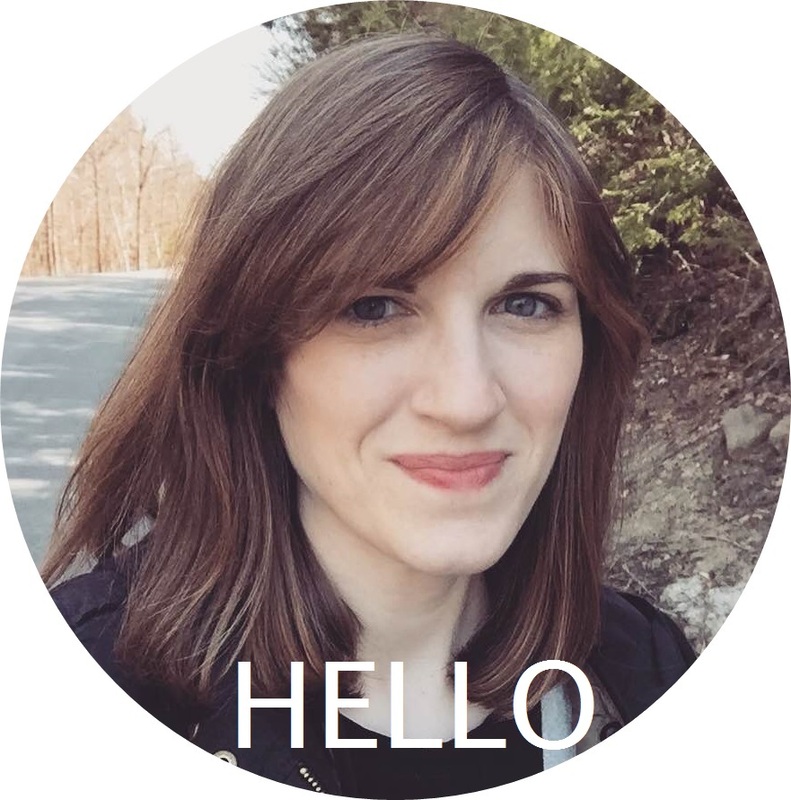 Also, my sister goes to Ithaca, and I’m dying to visit her and eat at Moosewood! Yeah, I’m pretty much done with this weather! But a soup like this would be perfect on a day like today. This soup looks amazing. And I’m not a big mushroom soup person… Maybe I’ll make it this week. 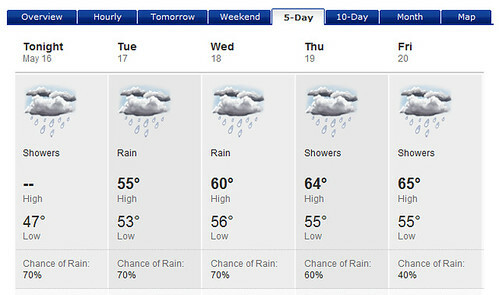 I thought I was done with soup for a while, but then this week’s weather happened and soup sounds comforting again. Especially this soup. This weather is unbelievable! But I like how it pushes me toward tea, toast, afternoon coffees, naps…..I’ve never cooked from Moosewood but always admired it on other people’s shelves. It looks so friendly. That looks heavenly. I can’t wait to make it! Of course, my son will think I’m trying to kill him, as he claims he doesn’t like mushrooms. Except on pizza. Weirdo. This looks a lot nicer than snails! Thanks for reminding me about Moosewood, my sister (who I’m staying with at the moment) was a fan of their recipes, I’ll have to ask her if she still has the book! This looks delicious! I love mushroom soups! After being reminded, I think I have to go there next time I’m in town. This sounds absolutely delicious- I love your descriptions! Mushrooms are a wonderful thing arent they? We bought the Moosewood cookbook while living in Greece, where we shopped daily for fresh produce. Love the book, love this recipe. Oh, I love the Moosewood cookbooks! This soup looks great, too! Oh, I love the Moosewood cookbook! This soup looks great, too! How many servings does the recipe make?! Kind of vital information, don’t you think? Hi Stella. The recipe makes 8 servings. I ordered my Moosewood Cookbook on Saturday after doing some research. I can’t wait for it to get here so I can start getting up to all sorts of vegetarian shenanigans! This soup looks delightful. Looks like barley’s on the list for my next Costco run! This is simmering as I type. It smells heavenly! Thank you so much for this recipe. 🙂 Might I add, this was the second Moosewood recipe I came across, and after fantasizing about this one, I resolved I HAD to buy the cookbook. I don’t think the edition I have includes this recipe…there’s a different mushroom soup one, but not this (either that, or I didn’t pore over it carefully enough). And I’m just now thinking that this soup would have gone splendidly with some of your pretzel bread. Yum. My husband and I thank you for a delicious meal. Well done once again!